Watch the new video for the track "We Own The Night", the fourth video from the Five album, on KNAC.COM HERE. The number five holds a deep significance. We have five senses. Five points adorn a star. Five represents man in theology. 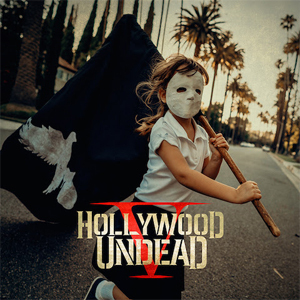 For the five members of HOLLYWOOD UNDEAD—Johnny 3 Tears, J-Dog, Charlie Scene, Funny Man, and Danny—the digit perfectly encapsulates their fifth full-length offering—Five [Dove & Grenade Media/BMG] out October 27th. Fans can pre-order the new album from HERE.